Project obstacles and solutions: The Federal Express Ground regional processing hub in Nashville, TN was expanding its facility to include a 15 acre parking lot for semi trailers. The excavation and paving of the parking lot was awarded to Jay-Ton Construction. 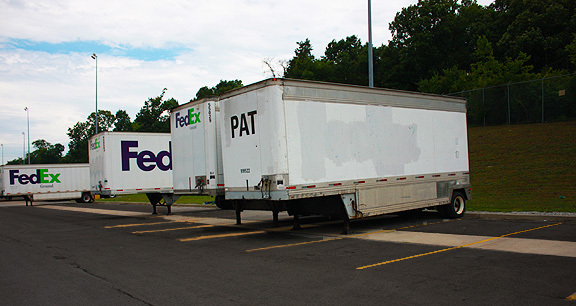 The design of parking lot was specific to the 53' box trailers that make up the FedEx fleet, with an eight inch concrete pad to support the landing gear and the maneuvering of the truck's back axles as they hook up and detach the trailers. The rest of the parking lot was paved with asphalt. To support the weight of hundreds of semis rolling across the concrete pads each day, rebar was placed in a crossing grid on three planes and tied throughout the slab. Whenever you have that much rebar, it is important that your concrete mix is designed to encompass all of the steel. It has to be mixed with a coarse aggregate that will not cause clogs and pockets of weakness in the concrete as it consolidates. IMI supplied a 4,000 psi concrete mix that was designed to work with heavy rebar placement. The rebar grid supplied structural strength to the slabs. Another consideration was the impact of freeze and thaw cycles on the concrete. To control thermal cracking and plastic shrinkage that occurs in curing concrete, IMI added synthetic microfibers to the concrete. To find out more about controlling plastic shrinkage cracking, click here.